In this years National Day Rally, the prime minister focus on a few broad subjects that are closed to the people’s heard. Cost of living, housing, utility prices. This becomes more like a session to provide justification for why they do things this way and answer to our most pressing concerns. These are also some topics that affects us more, and not important topics that affects us indirectly. Whenever this happens, I have a feeling we might be close to an election in 2019. With that said, I would like to focus on a topic that I have think about in the past (not that I am very very concern with) which is what are their solution to get out of this expiring HDB lease situation. Previously the Lease Buyback Scheme is restricted to those living in four room and smaller. Mr Lawrence Wong said this will extend to all types of HDB flats. Current take up rate is low. Proceeds received average about $146,000. There are not much quantitative numbers provides but that is understandable since it is to rally our morale, make us excited for a short while. It is short on implementation details and that may come later. If I were to further summarize this, it is to address the question of : can they assure the people they are not holding on to a depreciating asset? From my initial thought process and the numbers that I see, it seems that their plan for VERS solves this question pretty well. However, I question whether the actual execution would work very well. The short summary is that VERS will allow the HDB owner to sell their flat before the HDB flat starts depreciating. They have also provided an alternative to the issue of the low demand for old HDB flats. However, I feel that most people are not able to gauge the value of the asset they have, and have wildly different expectations of what is acceptable. Some folks hold sentimental value to the place. This makes successful VERS challenging. Which would ultimately not work out well. What I am interested in is to take a look at the valuation aspect, or the numbers part of this. Would government buy back at an attractive price, and if you reject that proposition, do you have good alternatives? To start with, in order for us to see why buying back from the people at around 70 years is the right time, we have to understand about land lease depreciation versus a freehold land. And to do that we firstly need to understand the leasehold table Bala allegedly created. I have no idea. It seems an employee in the government last time that works for the land authority in Singapore. It is named after him. Singapore Land Authority (SLA) publishes a Leasehold Table. This Table, often refers to as Bala’s Table, shows the value of a parcel of land with different lease terms remaining, as a percentage of its value assuming it were freehold. Basically this is a discounted values table, which tells us that the $1 today is much more valuable than the $1 99 years later. It shows that lease depreciation is not straight line. This was originally an internal SLA document, until it was leaked, where property players can use it to form their own valuation estimates. In 2000, SLA wanted to encourage the optimization of land use, to facilitate the redevelopment of Singapore. So they release this table. This table can be useful to property players, but also stock investors. It enables us to see for example, if you have a 100,000 sq ft property with 25 year land lease and you wish to top up to 80 years or freehold, how much additional charges you need to pay. It also gives us the basis of the cost of converting a leasehold to freehold. The Bala Leasehold Table, in this case, lets us know how fast our HDB lease could depreciate. The table above is the Bala Table. You can see the amount of lease left for the leasehold, and the corresponding percentage of freehold, this leasehold property is worth. Suppose you have an equivalent freehold HDB flat (we know freehold HDB doesn’t exist but hypothetically) that is worth $400,000. Next to it, there is a exactly similar leasehold HDB flat. If the flat has 99 year lease left, this leasehold HDB flat would be worth 96% of the freehold flat or $400,000 x 0.96 = $384,000. You will notice that the drop in value is uneven. The table above lets you see the speed of the depreciation of the HDB Lease. This applies to your private property as well. Each point shows the speed of depreciation. If your property have 80 years left, where the year of leasehold is less than 20, the year on year change is less than 0.74%. If you have 40 years left, or the year of leasehold is 60 years, the year on year change is less than 1%. After 60 years you can start seeing the drop off accelerate. After 80 years, the acceleration becomes crazier. If you bought your HDB Flat for $400,000 and the Freehold Growth Rate is 3%, How does the Leasehold HDB Flat Value Change over the 99 Years? We establish that the speed of depreciation start off slow but accelerate near the end of the lease. But how do we factor in growth, economic progress and replacement value? Overtime, due to inflation, demand and supply and economic growth, the HDB should appreciate in value. If the flat is freehold, where the government upholds the freehold nature of the title deed, the value of the property could theoretically grow at a compounded average growth rate (CAGR) of X% per year. However, because we establish that for leasehold, the value goes down over time, versus a freehold, the growth and depreciation will counter each other. What is the end result? Suppose you just bought a 4 room HDB flat for $400,000. Economic progress, inflation, deflation goes up and down, but overtime, the CAGR of a typical equivalent freehold is 3%. The table above shows the change in value if the HDB flat is a freehold status versus leasehold status. This is according to the bala leasehold table. It takes 31 years for the freehold value to reach $1 mil, but it took 39 years for a similar leasehold to reach $1 mil. The value of the leasehold is always less than the freehold. that isn’t a surprise. But you realize, at some point at 80 years, the value of the leasehold starts declining. You also notice there is a column call CAGR, The CAGR column calculates the compounded average growth rate if you sell off the leasehold property at that year, without factoring the closing costs due to the selling process. For example, if you sell off at year 10, the CAGR you earn per year is 2.40%/yr. 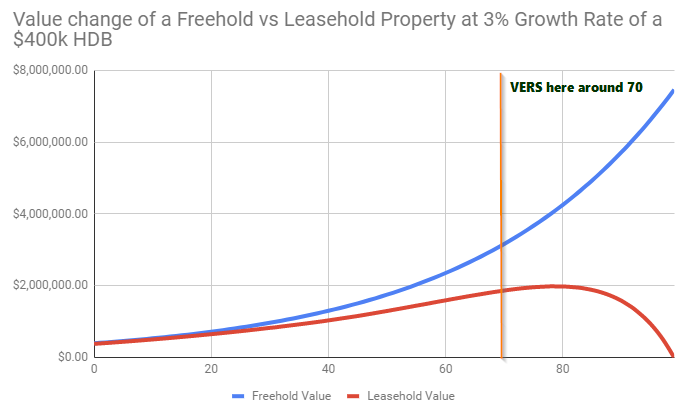 If we plot the freehold value and leasehold value in a chart, we can see why VERS is chosen at around 70 years. By giving HDB lessors the choice to vote for VERS, it allows them to sell back the HDB flat before the accelerated depreciation of the HDB lease. After 80 years, the drop off would be significant. If the objective is to address the concern that your HDB is a depreciating asset, selling back at around 70 years would enable them to sell off right before the point where the depreciation beat out the property growth. In this case, their HDB will always be seen as an appreciating asset. Maximizing your Growth…. And is it an Impressive Growth? While its damn impressive to see your flat grow from $400,000 to $1,900,000, you probably won’t enjoy much of it when you are 110 years old. If we were to be objective, let us plot the CAGR if we sell it in X year over time. The table above shows the CAGR if you sell off from year 0 to year 99. If the CAGR for the freehold is consistently 3%, what you can get for the leasehold is in theory less than 3%. The peak is at year 20 with 2.49%/yr. After that the CAGR starts dropping off as you take longer to sell off. If you sell off too soon, your HDB might not have reach the highest point. Of course, this assumes a constant growth rate. In reality this is not going to happen, property market moves in cycles and so there will be opportunities for you to do better, but also to do worse. These are unleverage returns, so by leveraging up, your mileage might vary. Why Do I believe in a 3% CAGR? It is not what I believe but what the narrative says. In his speech, Prime Minister Less stress that what they are focusing on is to ensure that housing is affordable for the people. In the newspaper these 2 years, we are seeing a lot of the narrative talking about your HDB lease will expire. You should not deplete your CPF for housing and must think about your retirement. When the developers secured en bloc land parcels, and the property market were in an early stage of the property recovery, the government put in more additional buyer’s stamp duty, higher down payment. This immediately halted the initial recovery in the property market. Why? Since 2013, they are still engineering a rather low growth property scenario. Recently, Temasek pushed for unique structured bond products such as the Astrea IV bond for risk adverse people to invest in. the narrative is to have a varied types of investment products that the people in this country can rely upon to build wealth. All this seem to point to a general narrative that the home is a place for you to live. If you do well and wish to build wealth, go to other things. If we are to believe, the government have the demand and the supply tools to enable the property market to be high growth or to be anemic. Which would way would they want it to go? Its anyone’s guess but my bet is that the current narrative leans closer to the populist view that HDB flat has to be affordable for the people. But at the same time they have to fix yesterday years problem. Another aspect are the other data that flirted pretty close to this rate. From 1962 to 2016 the inflation rate in Singapore is about 2.68%. For the past 20 years it has been below 2%. In the long run, if you wish for the home prices to be affordable, it should flirt closer to the inflation rate. 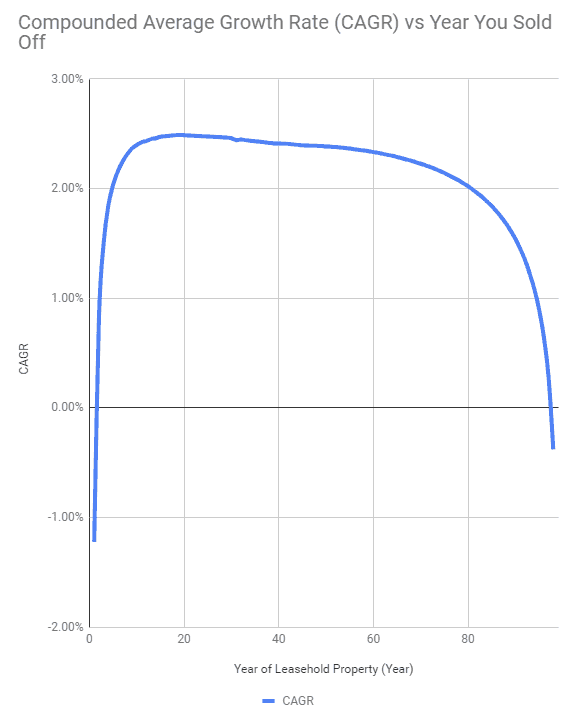 While it is not known what is the discount rate, or the opportunity cost of inflation used in the original Bala Leasehold table, many have reverse engineered and say its closer to 3.5%. To get a discount rate of 3.5%, you are expecting that the stream of cash flow that you can generate from the land grows at a rate that is closed to this discount rate but less. In 2013, when MAS set about the interest rate stress test in their calculation of the Total Debt Servicing Ratio (TDSR), the rate that they used for interest rate was 3.5%, which should be what they assume to be the long term (10 years) government bond rate. While it may be 3%, or 3.5%, I think that if they are intervening with this recent narrative, HDB is a segment of property they do not with the growth rate to go out of wack with inflation, long term interest rate cost of borrowing and GDP growth rate. To be fair as a counter point, the GDP Annual Growth Rate in Singapore averaged 6.65% from 1976 until 2018. Could there be more than 1 CAGR? It should be noted that my valuation is based on the future value of the leasehold going forward. What the government chooses to buy back at, is anyone guess. There is likely to be a small incentive premium to it. But my hypothesis is that it should not veer far from their current valuation metrics. However, the CAGR could vary a fair bit due to the changing demand and supply. There can of course be different CAGR. There will be older estates like Toa Payoh that is popular due to its proximity to town. There is a legitimate justifiable organic growth to the prices of such places. So we can see areas where the CAGR is higher. However, my take is also that since, today, we know these places are in demand, so you are already paying a premium for flats in this estate. The CAGR for these in demand estate might remain similar to other housing estates, but because you paid more for it initially, it gives you that feeling that you actually gain more out of this due to the better location. Would the Government Buyback the HDB Flats at a High Valuation? From Prime Minister’s speech, their idea is that this buyback is going to be costly, and it will not be as lucrative as SERS as these buyback are not going to be resold to private redevelopment at good prices. The term he is using is that there will be “less financial upside”. “There’s always this issue whether people feel they can find an appropriate replacement.”– Singapore University of Social Sciences (SUSS) Associate Professor of Economics Walter Theseira. If there is little financial upside, the conservative way to look at it, would be to ask what is the likely CAGR that we should expect the government to wish HDB flats to grow at. Which goes back to my previous CAGR discussion. Could You Reject this Buyback and Sell Your Older HDB Flat at the Open Market? However, the recent narrative in the newspaper have been that, now that everyone knows there is this land lease permutation (which everyone seem to discard previously), they are finding people are conscious about the land lease and the demand dropped off. As I have explained near the top, to purchase flats with 25 year of lease left, you cannot use your CPF anymore. With such a short lease, I wonder would banks be willing to lend at a reasonable rate. Currently, for a lot of people, they are asset rich and cash poor. On top of that, for older flats, in older estates, there is an ambience that may not be what younger dwellers are looking for. There might be a valid utility for estates that are closer to strategic working locations as the proximity to work place will override the ambience. There are also some individuals that would not live in a second hand places. I wonder how prevalent that is. It will be a niche group of people who would demand, and yet capable of buying these old HDB flat with short lease. If we look at the supply side, if a lot of your neighbors are rejecting VERS, that means there are a lot of available supply in the market. If you have constrained demand, and a lot of people supplying because they wish to sell of their old flats, would the price be higher than that of what the VERS can provide? The price the government offered by the VERS may act as a reference point, or a price ceiling what people are willing to pay for when purchasing a flat. While it was not spell out explicitly, I find it rather strange that the government announced the home improvement plan II to be around 70 years, which is close to the age that they would wish to VERS the HDB flats. I would think if you do it 10 years before VERS, where the owners can improve the estate, the estate looks better, it will improve the aesthetic attractiveness and make VERS more possible. But I won’t do both. However, I feel that this home improvement plan might prove pivotal if we consider how many people would opt for it. Would VERS Create a More Divisive Community? Through the En Bloc experiences we read for those successful and unsuccessful En Bloc, we can see that there are people who are motivated by the monetary gains. There are also folks who loved their neighbors and their estate and would not want to move. I do see what happen in En Bloc, happening in VERS. There is just less financial pot of gold, so I wonder if it will be much less successful. One thing I learn from writing about finance, and interacting with people around is that many do not know the value of what they have well. They overestimate the value of the asset they have, or underestimate the value of the asset they have. If you multiply this across many people, you wonder how successful this will be. But ultimately it is their way, as with many things to push the responsibility of your future into your hands. But ultimately you live with the consequences and not them. At the end of the day, the government wishes to realign to the idea that HDB is meant firstly for staying to form your family nucleus. If you manage to liquidate your old HDB flat, it is likely that you will need to purchase another place to stay with a longer existing lease. If you liquidate at slightly above market value, but purchase it at market value, it will not make so much difference to the wealth you can spend down. Downgrade to a manageable size – Your children might have moved out, so it might make more sense to get a smaller unit. My previous article does show you have to move from Condo to 4 rooms, or 4/5 rooms to 3 rooms to earn a comfortable spread. If its a 5 to 4 room downgrade, usually there is not much difference. Either way, to me its a very concentrated bet always to put all your wealth in your HDB. How would the Buy Back be Funded? There is a question that to carry out VERS across so much estates (since a lot were built together), how would this be funded. One obvious way is to increase the taxes to fund this. Another plausible way is that some of these successful VERS would be sold to private developers, with the proceeds used to fund subsequent buybacks. To relocate those people who decided to go through VERS, they might reallocate them to new BTOs, which tend to be more optimize based on home size and plot ratio. So on a large scale you see land parcels being free up, while squeezing the existing people in much optimized spaces. This seems a better way for the government to get a better margin compared to SERS. Are there other points I did not consider? Share with me your thoughts? Keep it Politics Free as much as possible. Agreed this is possibly the existential crisis of our generation in Singapore. It will take center stage. Short of offering freehold, Singapore could consider the route that the UK took which allows the current lease holder the right of first refusal to extend leases but it needs the Government to resolve its thinking on HDBs. Now that the country has become the wealthiest in the world there’s not really any further property value can go. Ownership has to start becoming a factor. Long read, while try to understand. But the fact remains people who can afford will pay more for a more centrally located and/or bigger HDB flat that could be way above the computed values by remaining tenure. So the ones at the perceived shorter end of the stick are likely the resale buyers. Given the same monetary outlay - say a bigger, centrally located 4 or 5 room older HDB flat vs a brand new but smaller and less well located private 99 LH condo, which one would one possibly put the money into? This VERS proposal will not be so straight forward. It helped me a lot to understand how leasehold assets should be valued. How about those with 50-60 years lease left? Not eligible for VERS anymore?